Additional security for your storm door. Ideal Security's Lockable VP Pull Handle (SKVK) Pull Handle for out-winging storm and screen doors allows for the outside handle to be locked as you leave the home. SECURITY:Turning the key blocks the exterior pull handle so the door will not open. The key does not lock the interior handle (included). To lock the inside handle simply slide the switch. If the handle is locked from the outside, the inside remains unlocked. However you can lock yourself out if you are not aware that someone has previously locked the outside with a key. Always check the outside handle to make sure that no one has locked it to prevent being locked out. WHAT'S INCLUDED:The set includes the outside and inside handles, solid nylon strike (for smoother closing) and all necessary screws, spindles for storm and screen doors from 1 inch to 2-1/8 inch thick. EASY UPGRADE OR REPLACEMENT:The SKVK replaces most standard push button, pull and lever handles that are surface mounted and have screw posts that are 1-3/4 inch apart. Deluxe Storm & Screen Door Lever Handle With Deadlock is rated 4.9 out of 5 by 8. Rated 5 out of 5 by Bill from This part was an exact match for replacing the brass... This part was an exact match for replacing the brass lever handle with deadbolt originally on my storm door. Rated 5 out of 5 by HomeDepotCustomer from This is the exact one I was looking for!... This is the exact one I was looking for! Rated 5 out of 5 by Loren from Is working well and I was able to install it... Is working well and I was able to install it myself. 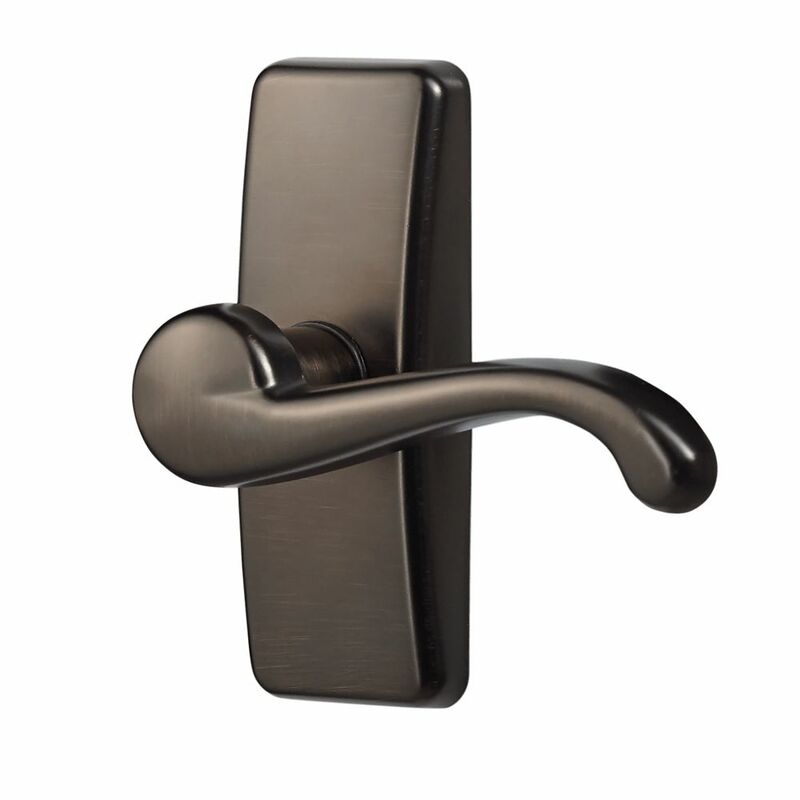 Rated 5 out of 5 by BronzeHandle from The color of the knob goes great with the white door. It is nice to have the handle working. The color of the knob goes great with the white door. It is nice to have the handle working. Rated 4 out of 5 by Toolgirl from Easy to install, looks great!... Easy to install, looks great! Rated 5 out of 5 by slpemd12 from Good quality, excellent instructions for installation. Previous screen door handle... Good quality, excellent instructions for installation. Previous screen door handle was one of the many less expensive ones that broke in less than a year. This handle is far superior and well worth the price. Rated 5 out of 5 by DIYmom from Great replacement handle for high end storm doors Bought this online to replace door latch on an expensive Andersen full glass front storm door that was damaged during a severe storm. Finish looks high end, seems durable, all necessary hardware came with it, installed in minutes, and good price. Rated 5 out of 5 by jtvjohn1 from EXCELLENT PRODUCT FOR THE MONEY Easy to install, finish is excellent, and works perfectly. Looks great to.